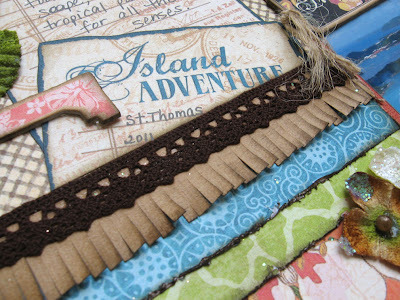 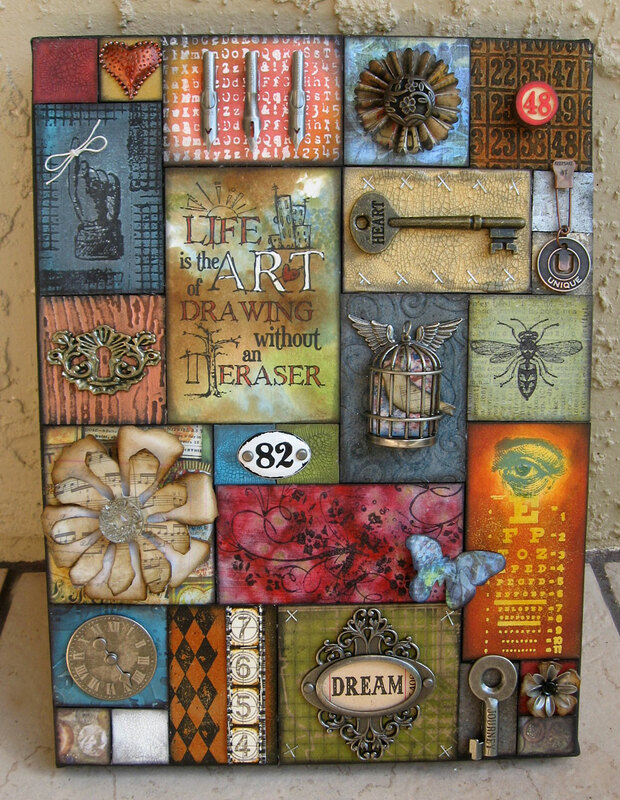 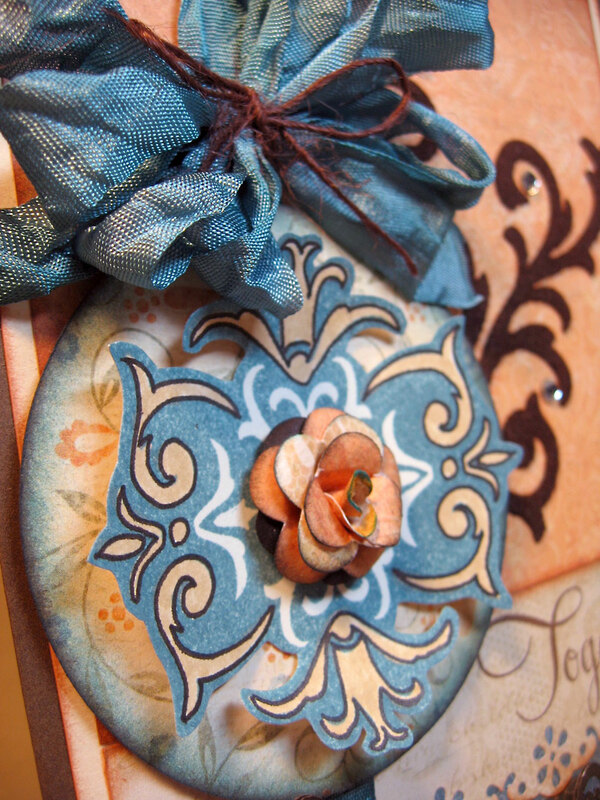 A few of my girlfriends were lucky enough to take a few classes with Tim Holtz this past summer at Whim So Doodle in St. Petersburg, Florida and came home with several projects, one of which was a wonderful patchwork filled with Tim's techniques. 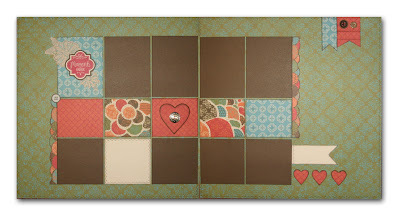 Like me, many of you have probably seen different variations of patchworks by Tim. I've always had it in the back of my mind to create one myself, and I finally got an opportunity so I'll be teaching this one at my All Things Tim class this month. I got out my trusty Compendium of Curiosities book and started studying the techniques, picking and choosing which ones I wanted to use. 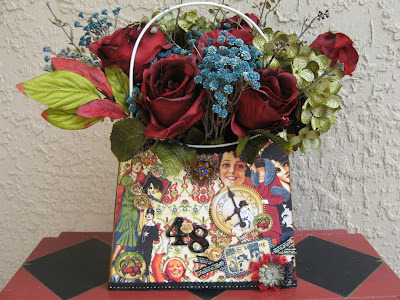 Then I went to my local craft store and purchased a black 9 x 12 canvas on which to mount everything. 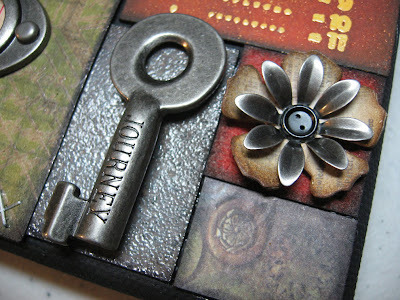 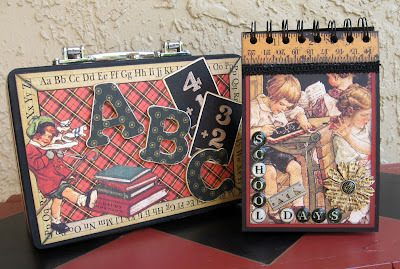 Finally I got out all my Idea-Ology goodies and Stampers Anonymous stamps and spread them out before me. 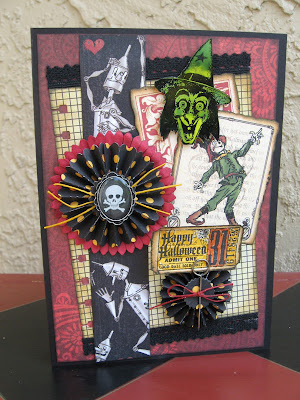 And let's not forget my Sizzix Alterations dies too. 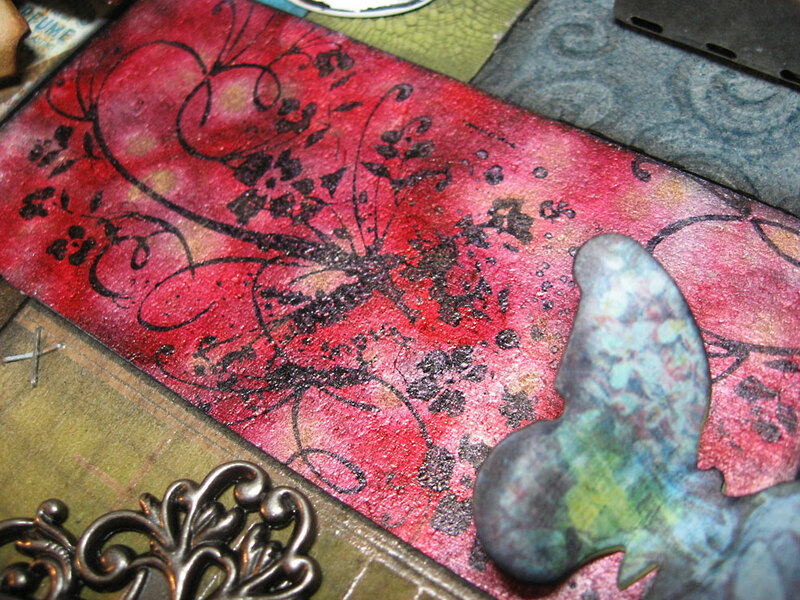 This was just a Kraft Resist thing I did with Peeled Paint Distress Stain. Thanks for stopping in today. I always appreciate it! What fun I've been having the past few weeks, secretly creating projects for the fabulous opportunity to audition for the Graphic 45 Design Team! 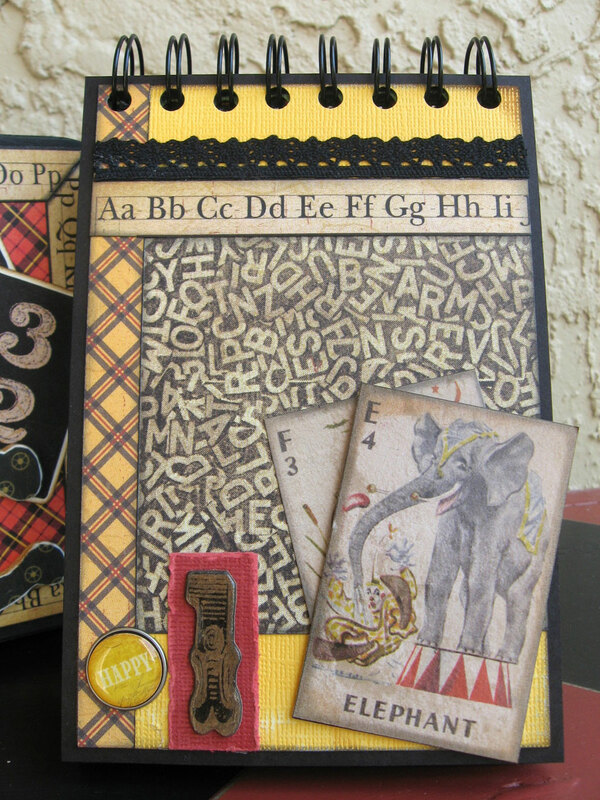 If you've never heard of Graphic 45 I must ask you "where have you been?!" 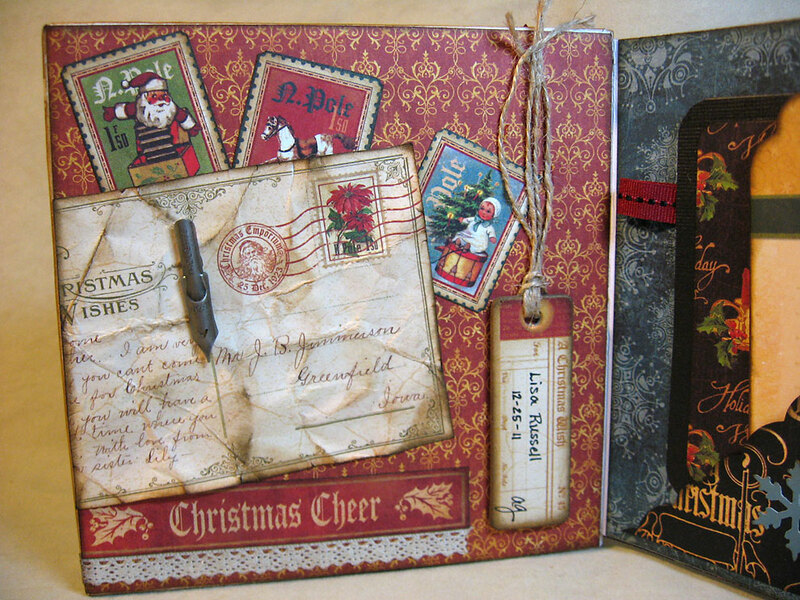 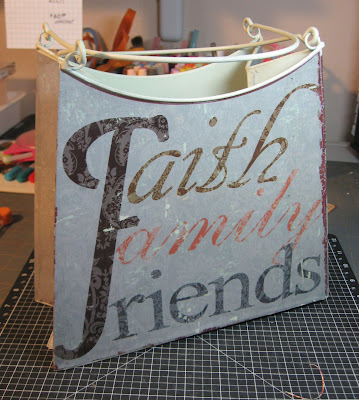 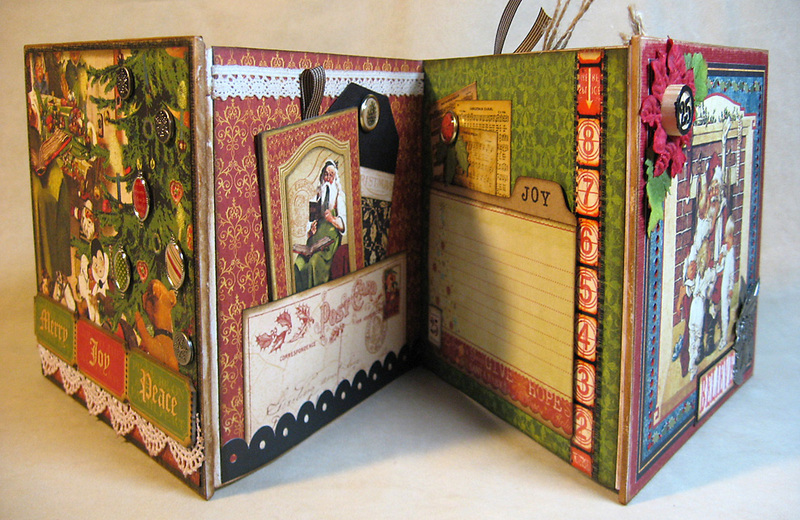 They carry some of the coolest, vintage-inspired paper-crafting products you can find. Full of deep color and richness, it's just plain yummy is all I can say. 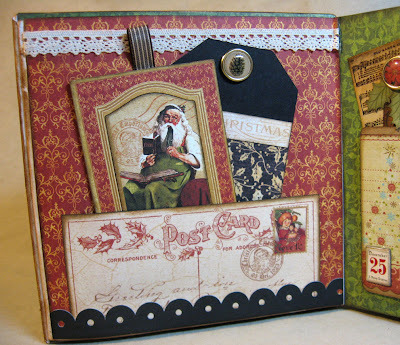 You can check out their blog here, and their website here. The requirement for the first round is to submit at least six projects showcasing any of the following: cards, layouts, videos, and home decor projects. Using Graphic 45 products is not required, although preferred. 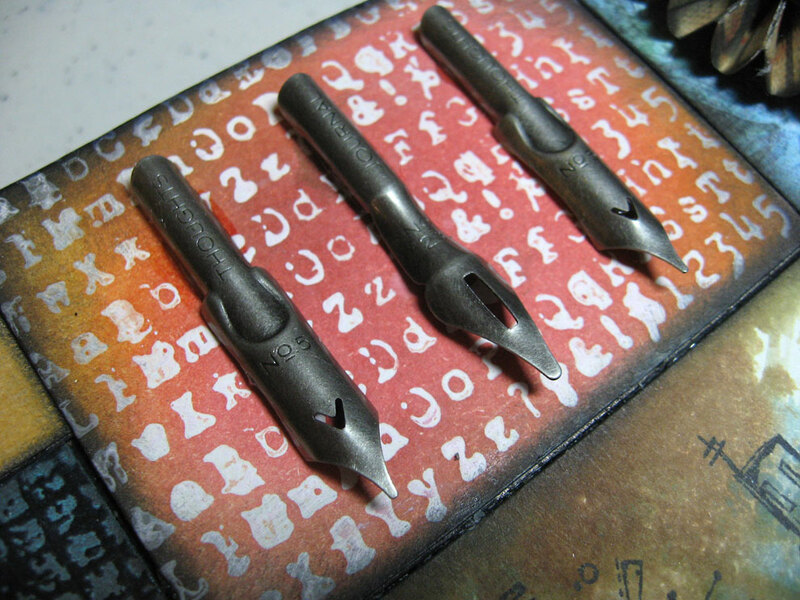 So let's get on with it then. (I'll warn you: this is a LONG post with tons of pictures) I am submitting the following six projects. 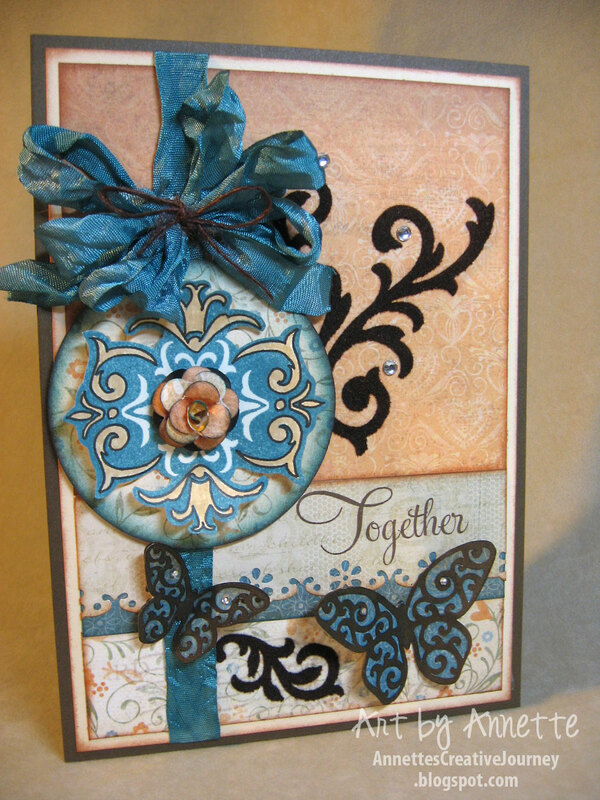 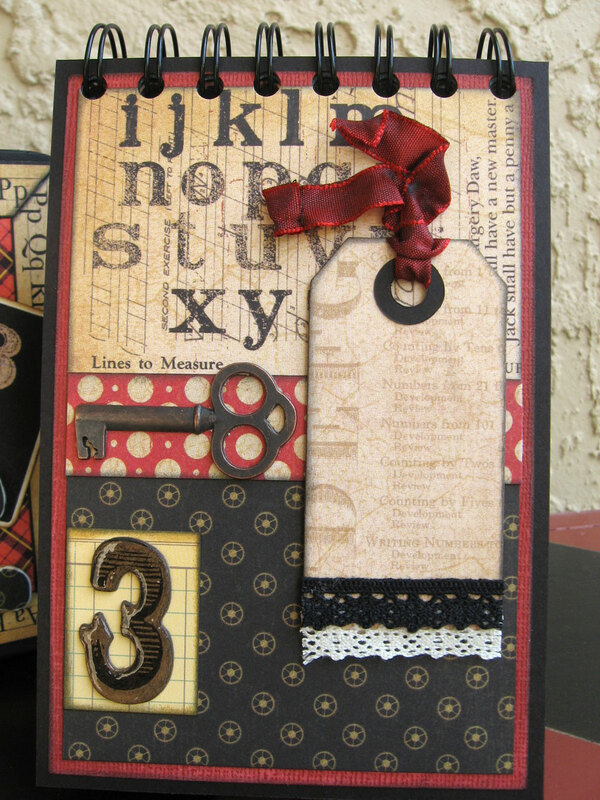 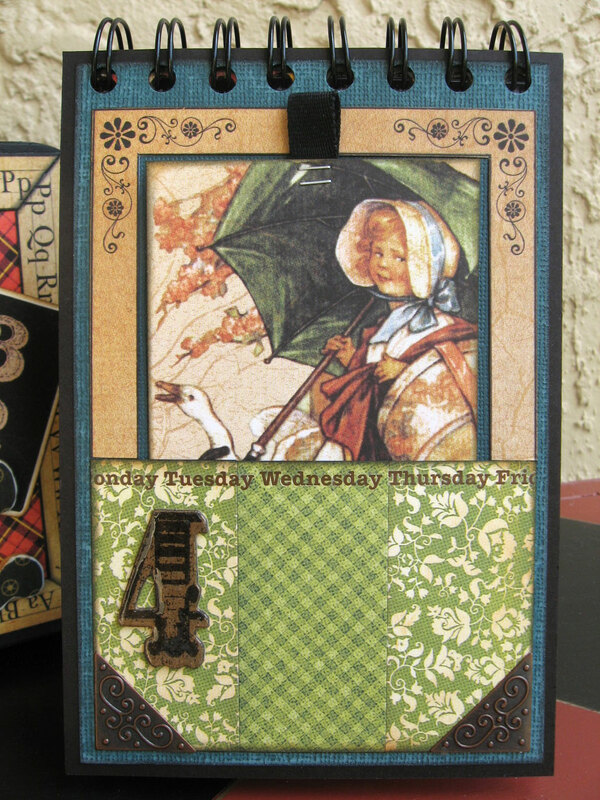 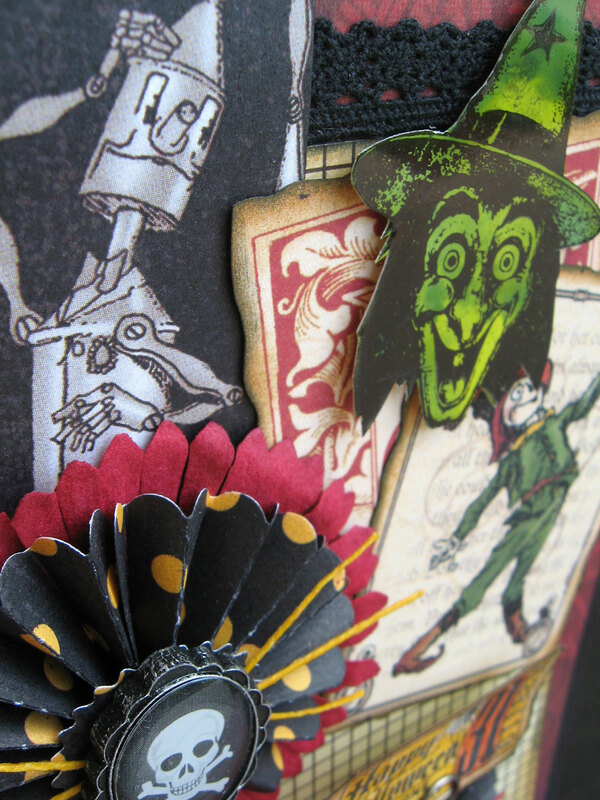 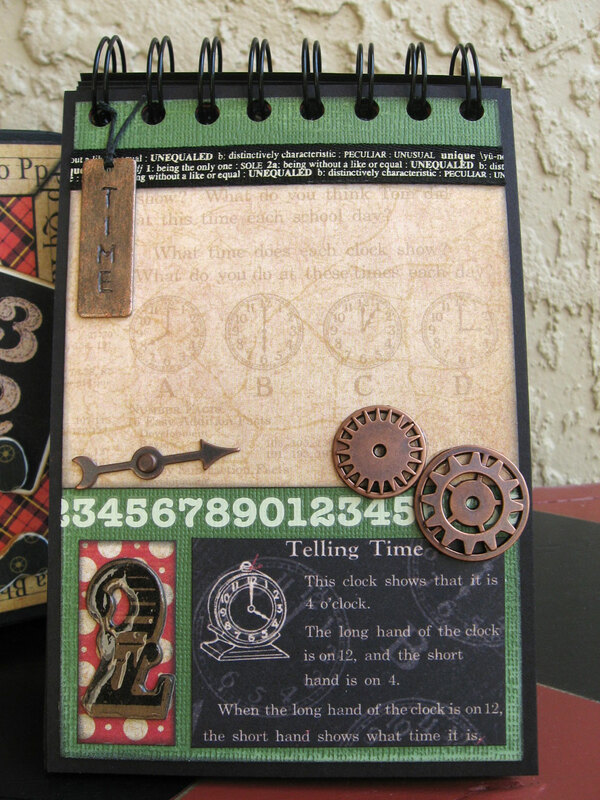 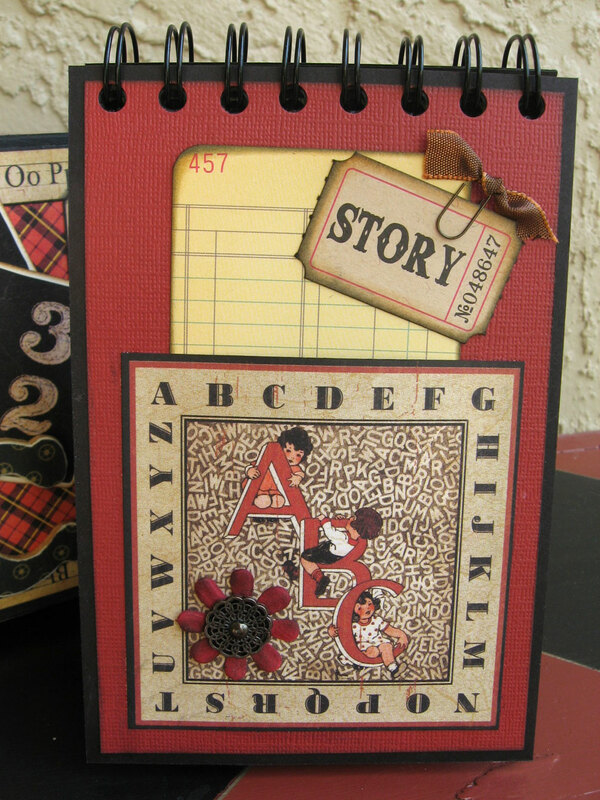 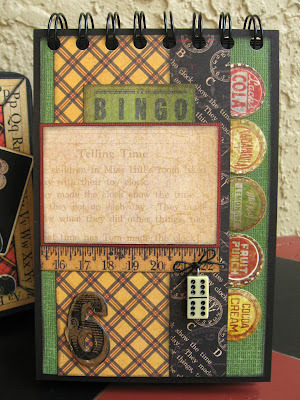 This card utilizes Graphic 45's The Magic of Oz paper line. 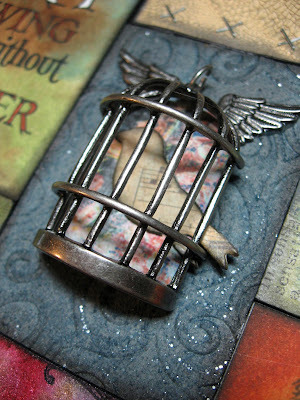 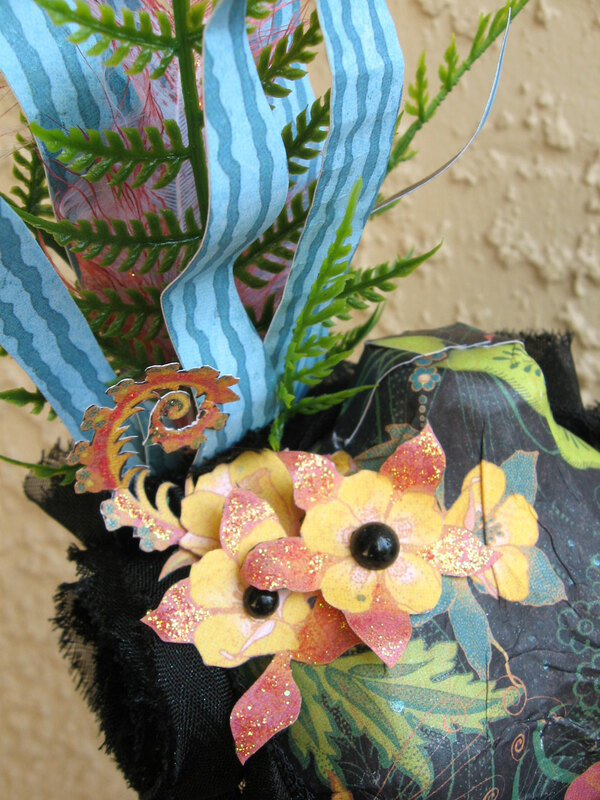 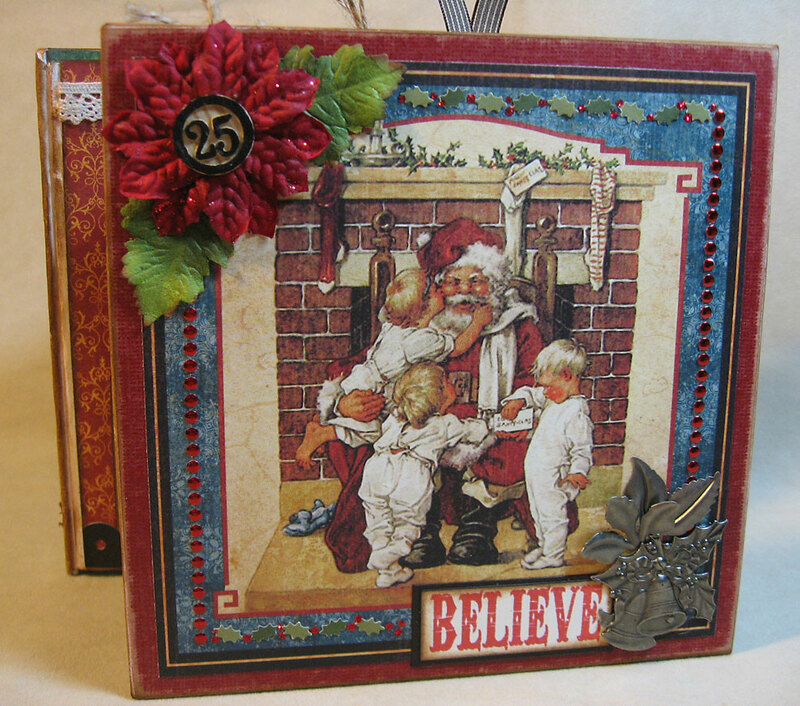 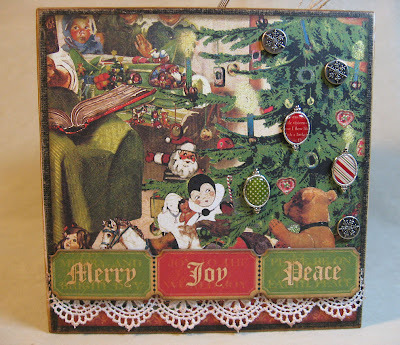 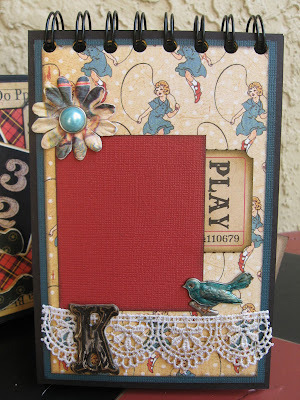 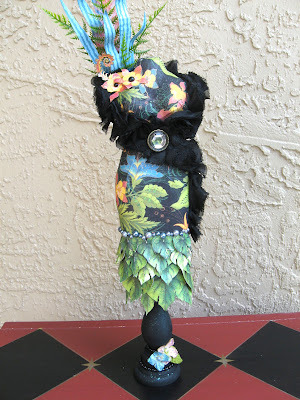 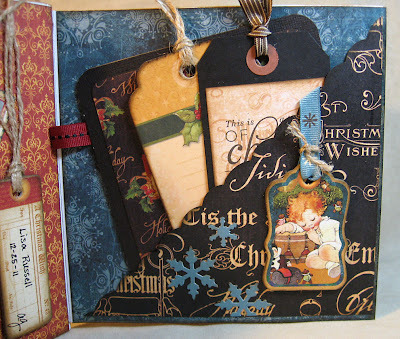 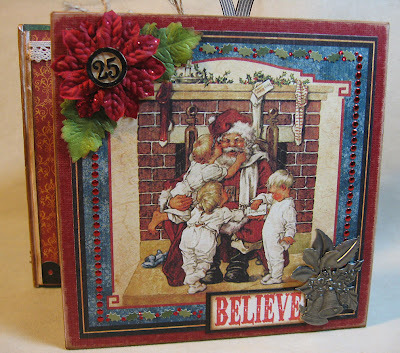 I had some fun mixing a few other embellishments in to create a fun and whimsical feel. 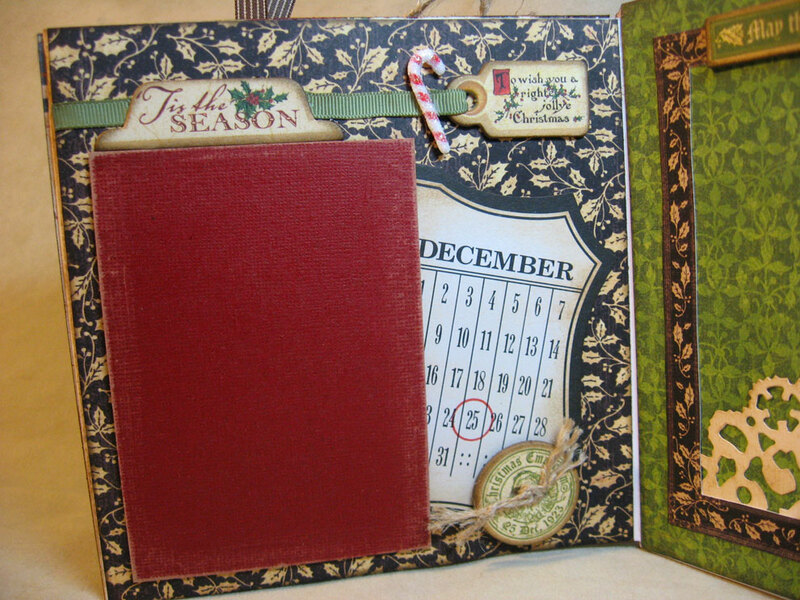 This 6 x 6 table-top display accordion album utilizes Graphic 45's Christmas Emporium paper line and coordinating card stock die-cuts. 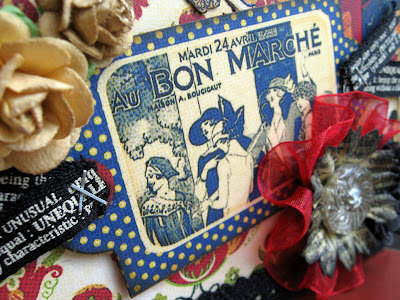 When I say "yummy" I really mean it. 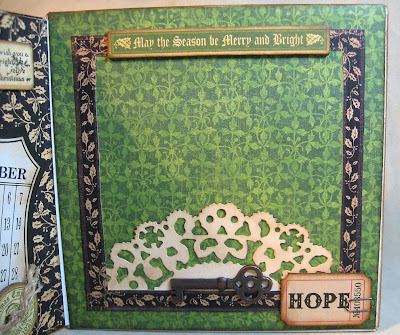 I knew when I saw this paper in the local scrapbook store I immediately had to have it. 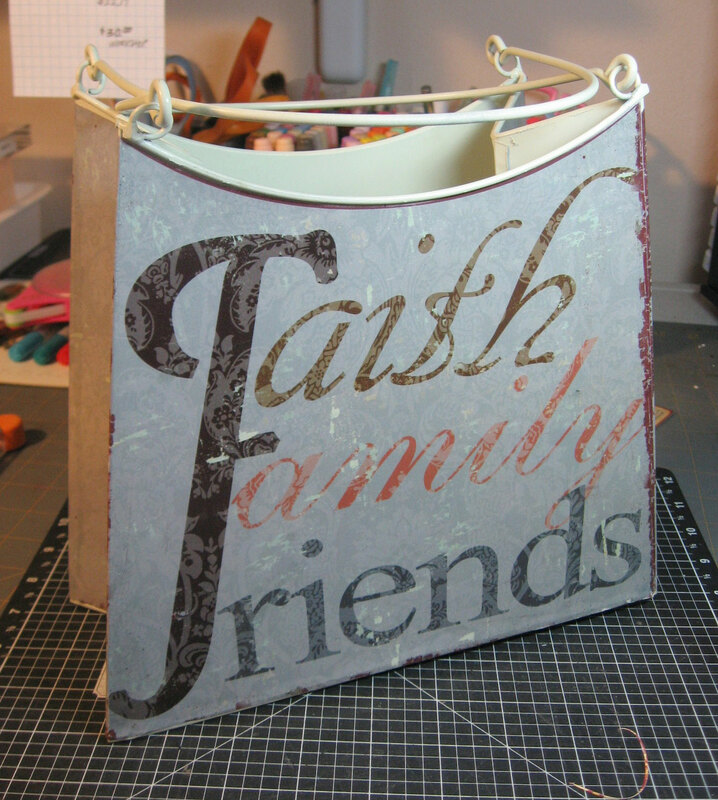 This project started with this fairly unattractive tin I found in the clearance section of my local craft store. 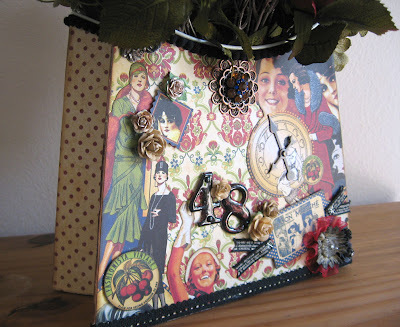 Using Graphic 45's Fashionista paper line and a variety of embellishments I had on hand, the tin was transformed into a pretty home decor piece. I just love the vintage images of the ladies. 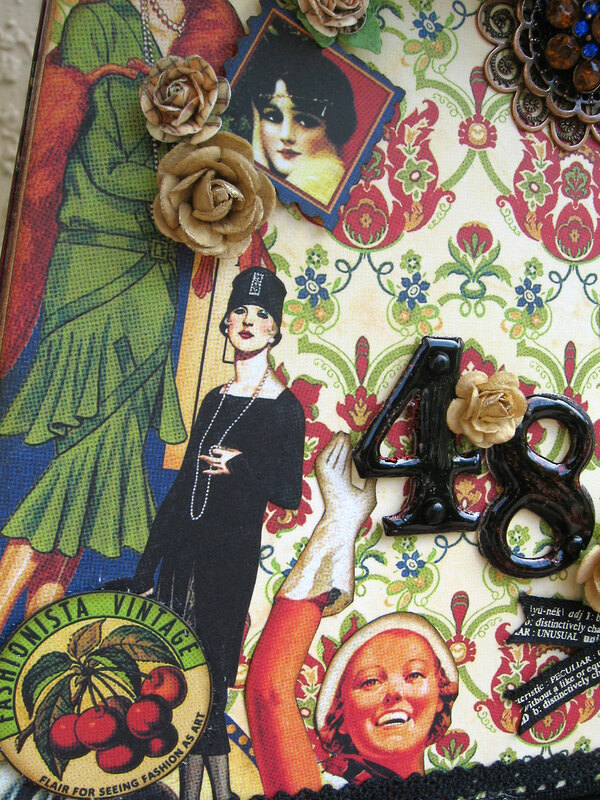 I swear I was supposed to be born in this era. 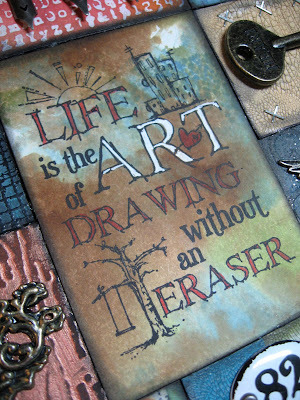 It's me all the way. 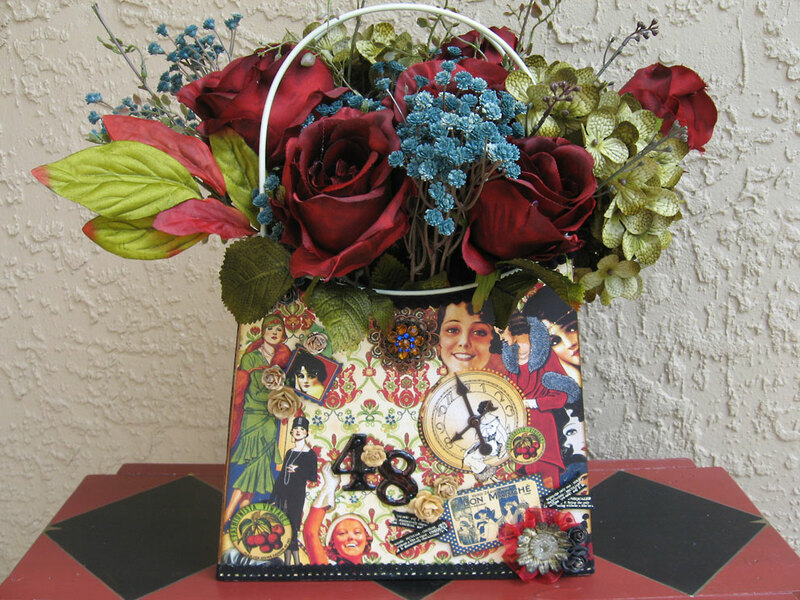 Add some flowers and the tin has a whole new look! Close-up 2. Why the 48? 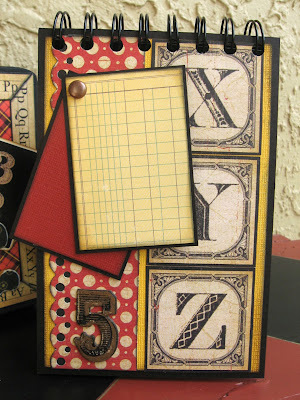 Why not 45 for Graphic 45? 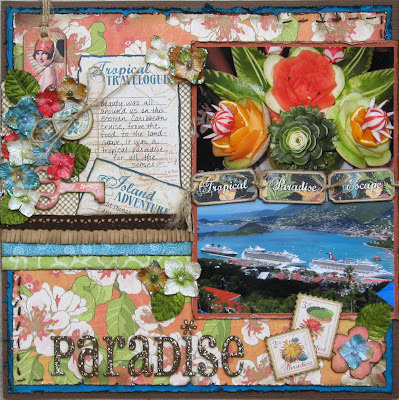 Using Graphic 45's Tropical Travelogue papers and a few extra embellishments, I had fun creating this whimsical decor piece. 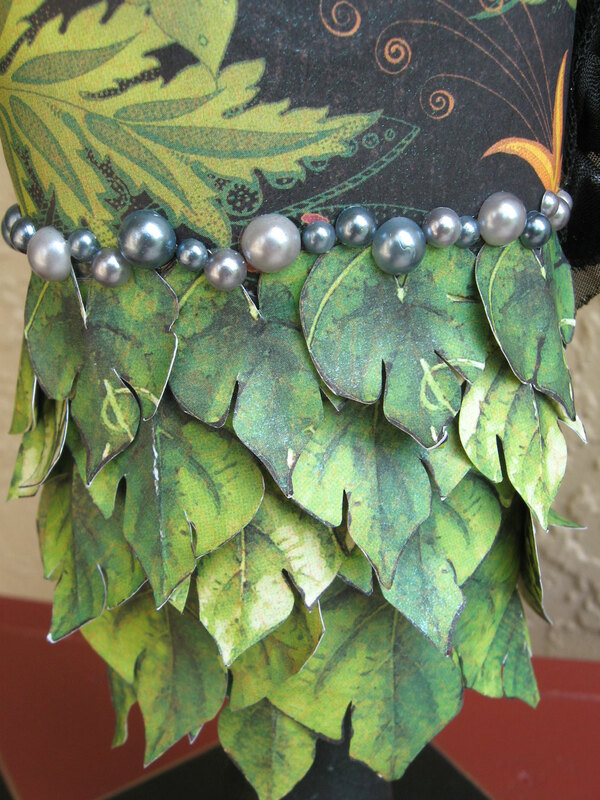 A seamstress I am not, so I just gave the main piece of tropical paper a rough cut, spritzed it with water and started decoupaging it to the bodice. It took two pieces; one for the front and one for the back, and with enough patience and massaging, I was able to get it to conform pretty well. The flower accents are cut from the paper and sparkled up with some Stickles. Artificial ferns help to accent the paper strips shooting up from the bodice, along with a single feather spritzed with color to match the theme. 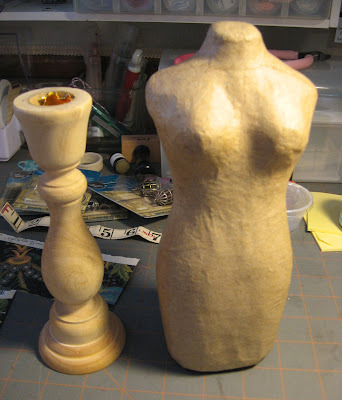 This was the part I had in my head when I first purchased the dress form. 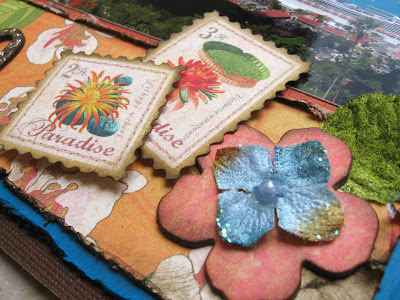 I knew the Tropical Travelogue pack had a sheet full of these beautiful tropical leaves. So I sat down, put on the Food Channel and started cutting each and every one of those babies out and layered them onto the bottom of the dress. Adhesive pearls in shades of gray cover the seam and add some glitz. I couldn't wait to start scrapbooking the cruise I took with friends back in the fall, and I knew that Graphic 45's Tropical Travelogue paper was the perfect choice for my experience in the Eastern Caribbean. Not only is the paper beautiful, but the coordinating chipboard die-cuts are (I know I keep saying it but...) super yummy! I mean, what is it about scrapbook paper that makes us feel this way? 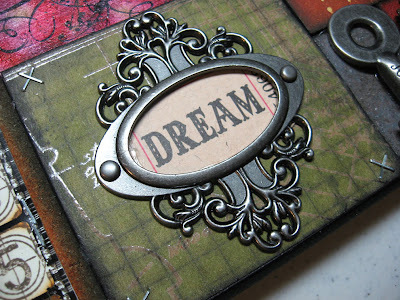 And I know I'm not the only one. Right? 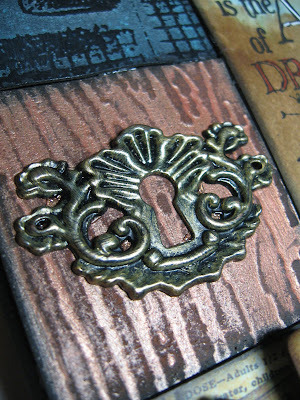 Close-up 1 shows off some of those pretty chipboard die-cuts which I adored with some twine. 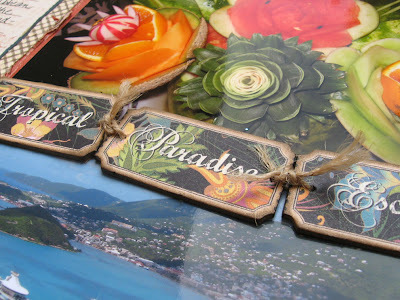 The chipboard die-cut tropical tickets are connected on the sheet, but here I simply cut them apart, pierced a hole and reconnected them with twine for a border between my two photos. 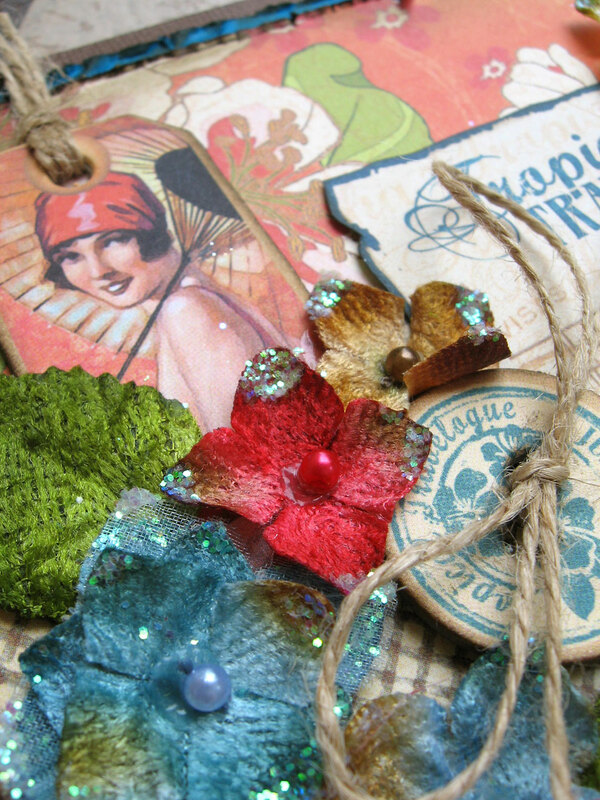 These pretty vintage botanical-style postage stamps are on a full sheet of the 12 x 12 paper in this pack in various sizes. 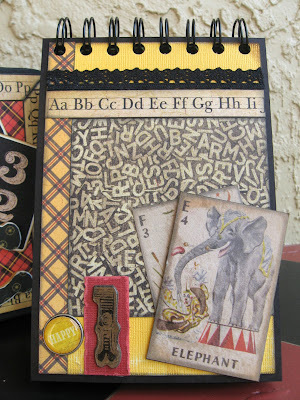 A little inking of the edges and some foam tape to pop them up and they become great little page embellishments. 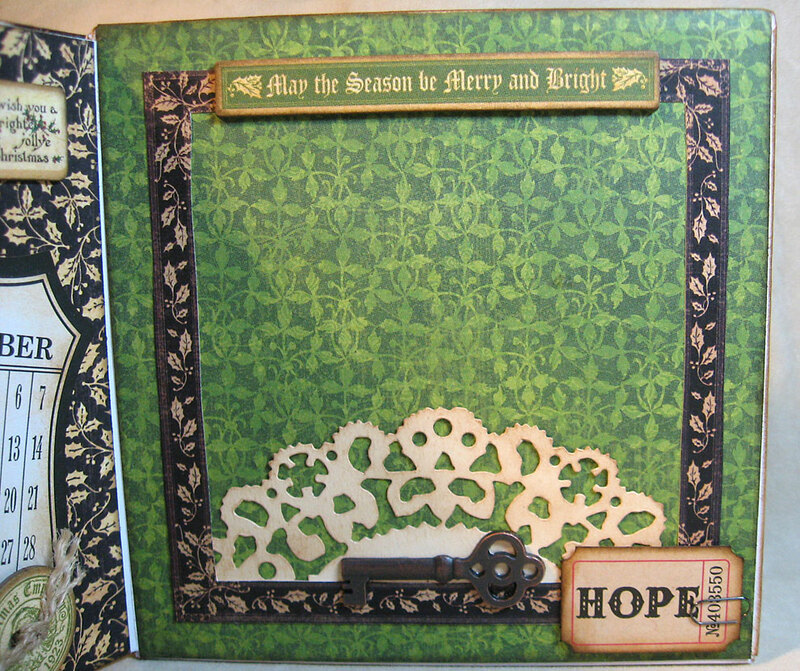 I pulled in some of Graphic 45's Core-dinations card stock into the layout to create the page background, the photo mats and this fun fringe accent. 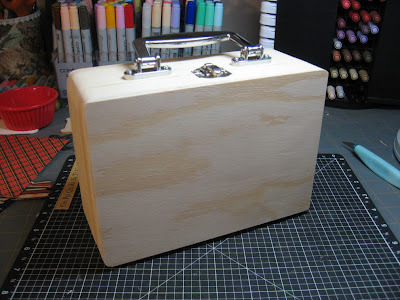 My final project started with this unfinished wooden lunch box from my local craft and hobby store. ...which contains a coordinating School Days grade school album that is spiraled at the top to make a vertical style mini which measures 4 1/4 x 6 1/4 inches. 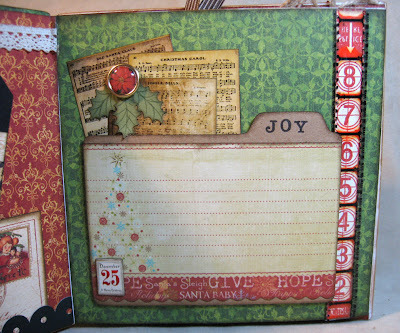 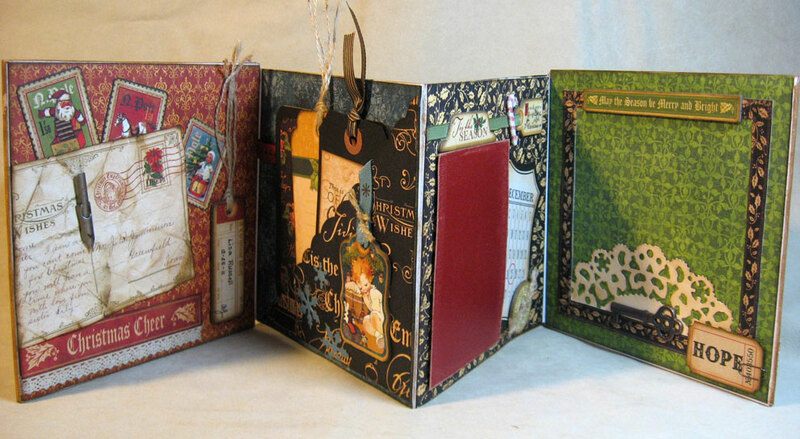 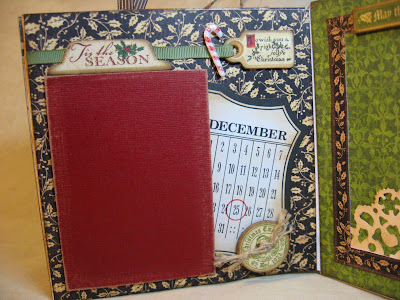 The mini begins with a simple page to start off the "story" using a pocket pull-out for journaling. 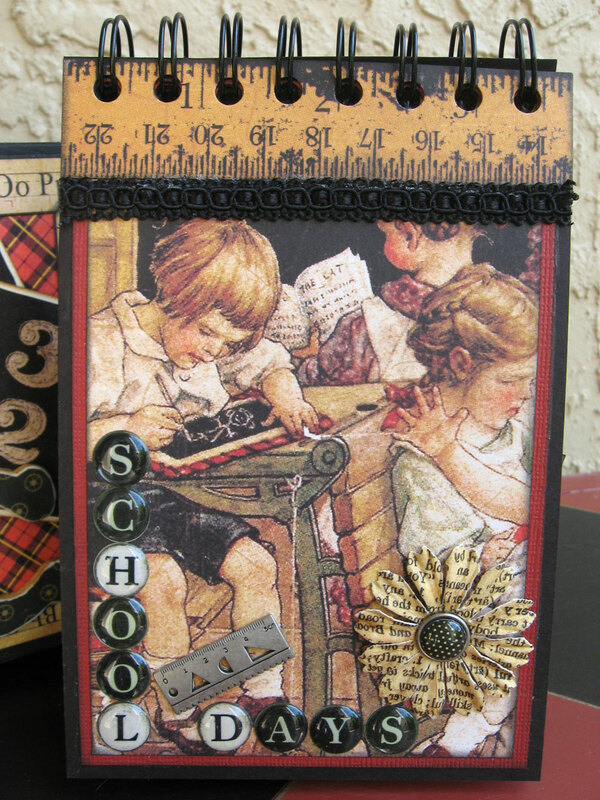 Then continues through each grade level in elementary school. 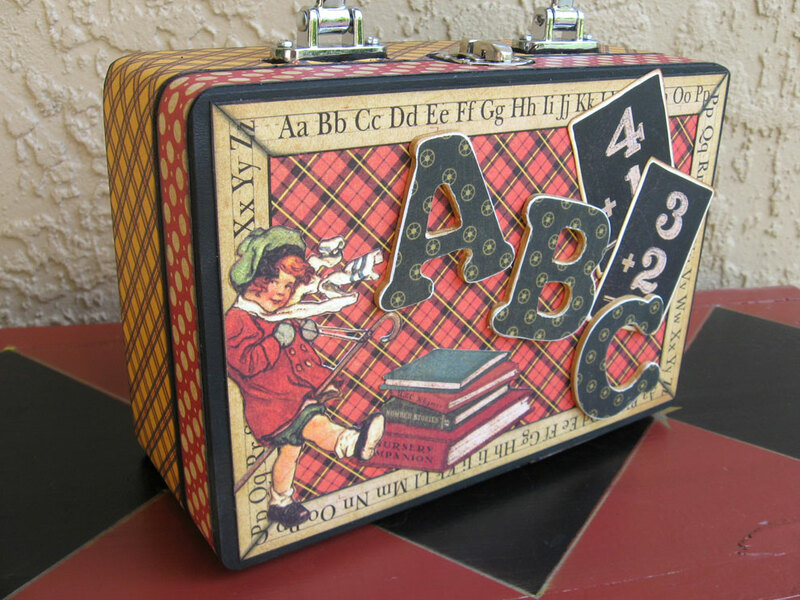 (In Florida our kids go K - 6). One final look how the two projects look together. 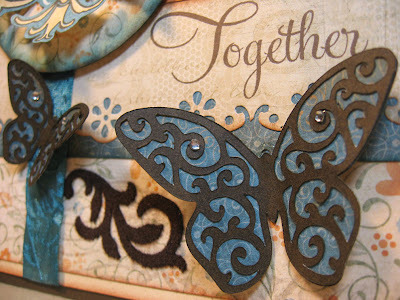 If you made it this far into this post, I owe you a HUGE thank you for hanging in there. 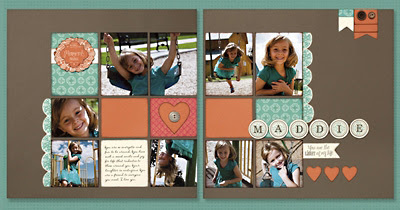 I would love to have your feedback and hope you enjoyed looking at the projects as much as I enjoyed creating them.